Welcome to Walden! A place that combines the beauty of the natural world with the warmth of a modern cabin. Located on 54 acres along the historic Shenandoah River, Walden offers one of the most spectacular retreats in the valley. 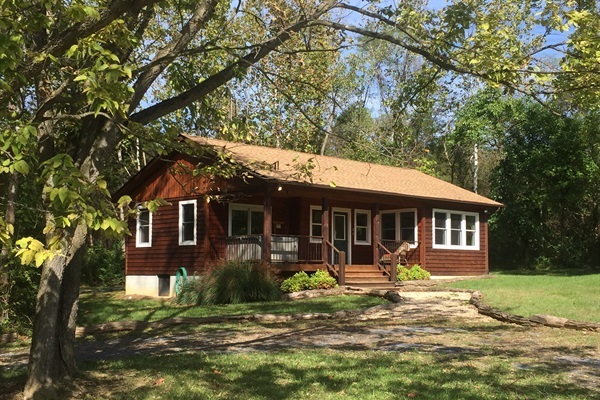 Completed in 2013, Walden is a deluxe one bedroom cabin that is timeless. Nature prevails through every window with the sweeping views of the land that surrounds you. From the moment you arrive the feeling is captivating. Walden offers a spacious living room with natural wood cathedral ceilings, a gas log fireplace, flat screen (satellite) TV, DVD, High Speed Wireless Internet and Stereo. The kitchen is fully equipped and for dining you have the option of eating inside, or just a step away, you can dine outside on an 8x12 screen porch. The bedroom has a queen bed, ceiling fan and 14 foot cathedral ceilings. Walk through the patio door on to the front porch and settle into a warm, relaxing hot tub. The bathroom has a gorgeous step in tile shower with a gentle flowing rain style shower head.